Back issues of the May 29 edition of the Troy Times-Tribune are available. 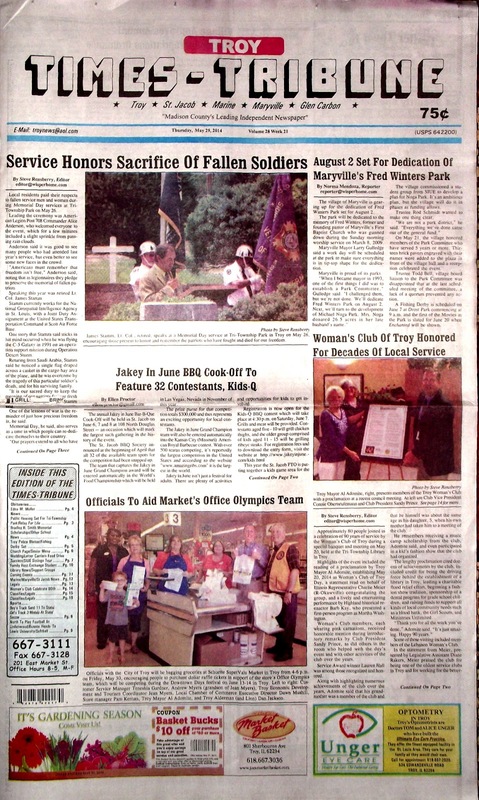 Some of the stories in this issue: Memorial Day Service Honors Sacrifice of Fallen Soldiers, Fred Winters Park Dedication Set for August 2, Jakey In June BBQ Cook-Off to Feature 32 Contestants, Woman's Club of Troy Honored for 90 Years of Service, Officials Promote Office Olympics Contest, Marine Approves Budget-Appropriations Ordinance, Maryville Adds Summer Jobs, Bradley R. Smith Memorial Scholarship Recipients Announced, Girls' Track Team Brings Home 3 Medals from State, plus a column by the editor on thoughts about our fair state of Illinois, a feature on German Exchange Student Jenny Leathers, a full page with a proclamation and photos of the Woman's Club of Troy, police blotters, and a whole lot more. This issue carries an obituary for Edna M. Mollet.